I just realized the maximum post character count was reverted from 100,000 (the maximum) to 5,000 in the upgrade. Fixed it! Sorry about the extended downtime today. Three Rivers lost power from 9:00am to around 1:00pm and I forgot to set the web server to auto-boot. I've corrected that issue, so the web server will once again automatically boot following any extended power outages. I'm going to be doing some work on the server this weekend, so the forum will be running slow at times and down entirely at other times. It'll be faster than ever once it's back, though, which is great for all two of us that use it! Doing some software upgrades on the web server today, so expect more slowness/downtime. It's currently running on Server 2012 R2 (the analogue to Windows 8) and the UI is god-awful, so it's time for an upgrade! The FTP and web server were down due to some network shenanigans. Apologies! The forum and FTP server will be down tomorrow from ~7:30am until sometime tomorrow afternoon. We're getting our electrical service upgraded from 100 amp to 200 amp, which requires replacing the breaker panel, electrical meter, and the main line running to the house. We'll have a few more hours of downtime tomorrow to wrap up the electrical work. The forum and FTP will be down intermittently over the holiday weekend while I completely rebuild my home network. I picked up a new four-post network rack and a used UPS, router, and firewall to replace the absurdly old stuff I'm using now. The current router and firewall were installed in 2010, so they've had a good run! I'm still whittling away on the network migration. The new UPS, battery pack, router, and the first of three PDUs (fancy power strips) have been installed. I've also moved over the core switch and wireless LAN controller. I've got the new firewall racked (and holy crap is it heavy), but still need to complete the configuration, so I've got this Frankensteinian abomination of cables running between the new and old racks. There will be some additional downtime (tomorrow?) for a few hours as I migrate to the new firewall, and some very short intermittent downtime next week as I dress all the cables. I went a little bit overboard on the firewall. It ended up pulling about 800 watts steady state (roughly equal to an dual-GPU gaming PC going full-bore) and it put out heat to match (the basement was 85° tonight with an outdoor temp of 60°) while sounding like a freight train. A fan mod was out of the question due to the heat, so I threw in the towel and picked up a couple of the next-largest firewalls instead. They're way less powerful (1.2Gbps each versus 10Gbps), but having two of them let me put together an automatic failover bundle like I used to have, so that's a nice consolation prize. I installed those tonight, so apologies for the downtime. I've got to finish the cabling for them tomorrow, but I'll try to keep one of them up while I work on the other to minimize downtime. Outside of the firewall cabling, the only thing left is the new wireless system. I picked up a couple of 802.11ac access points and a new wireless controller to manage them. If all goes well, I'm going to throw another access point in the garage and bridge it back to house to provide better wireless coverage out back. I'd like to put an outdoor AP on the back of the house, but I'm not sure I'm going to get Meredith to go for that. I was trying to figure out why the forum was running so incredibly slow. It ends up the click log (the thing that logs every single visit) was up to 90 megabytes, and it's a flat file, so the web server had to load the entire thing to update it every time someone hit the page. I've archived the click log and suddenly the forum got as zippy as it should have been all along. Here's a look at how crazy the performance hit was. 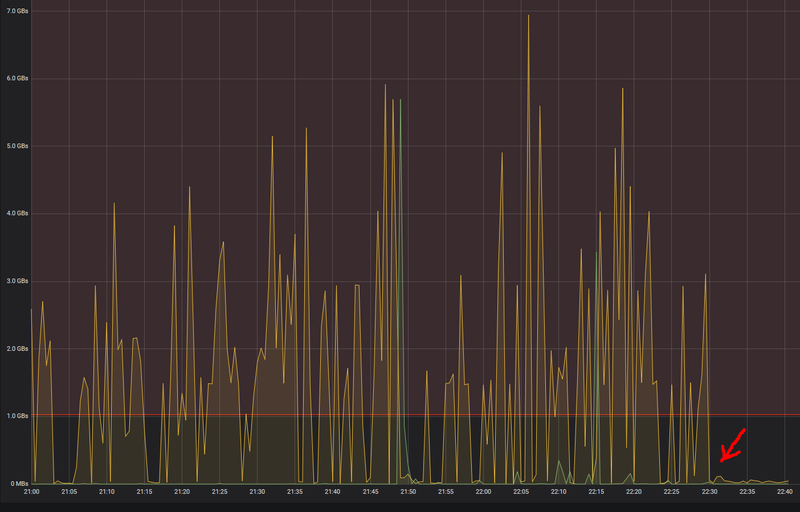 The web server runs on a 16-disk SSD array, and every time someone (or, more likely, some bot) would hit the forum, the web server's disk IO would spike anywhere from 2-7Gbps. The red arrow points to where I archived the click log and created a new one. Much smoother! Wow that's pretty impressive. Funny something that's not even 100mb causes that much disruption. Thanks for keeping the board alive and ticking. The forum and FTP will be up and down a bit over the next couple of days as I get a new server installed and functioning. Apologies!